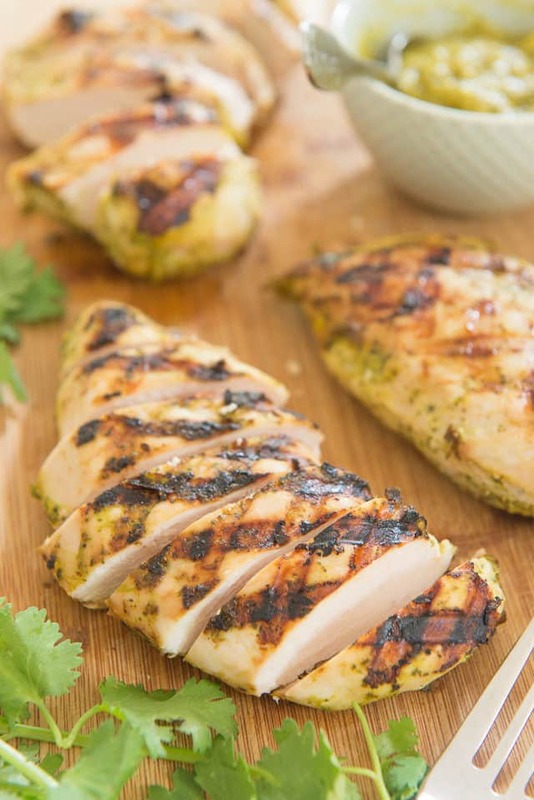 Chicken breasts are marinated in a tropical mixture of mango, cilantro, coconut, and ginger, then thrown on the grill. 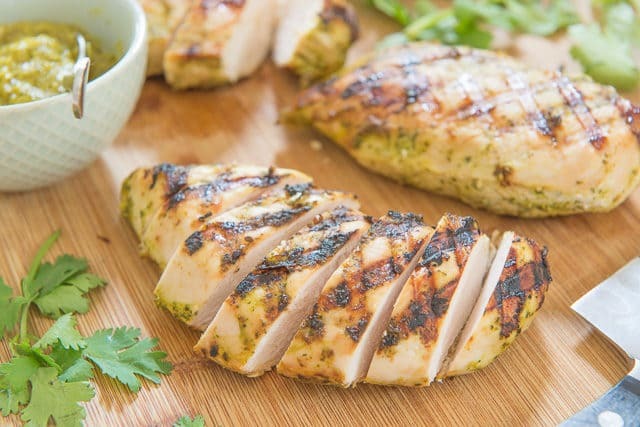 The chicken breasts turn out so juicy and flavorful! Making this recipe reminded me of the power of marinating. But OH MAN I forgot how juicy it makes the meat, in addition to adding lots of flavor, of course. This is definitely the juiciest chicken breast I’ve had in a long time. This recipe is a slight adaptation of a Truvia recipe I made many years ago. 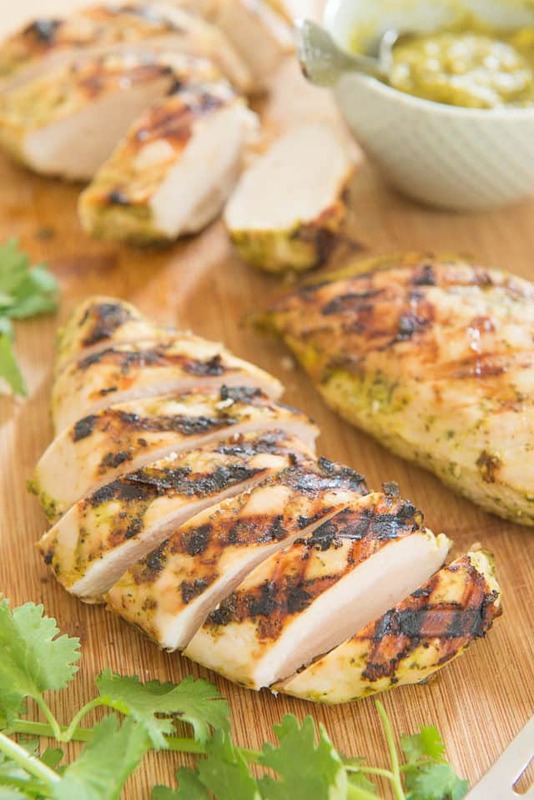 The marinade has three main ingredients that flavor the chicken: mango, cilantro, and coconut. It’s very fresh, vibrant, and tropical! Let’s make it. 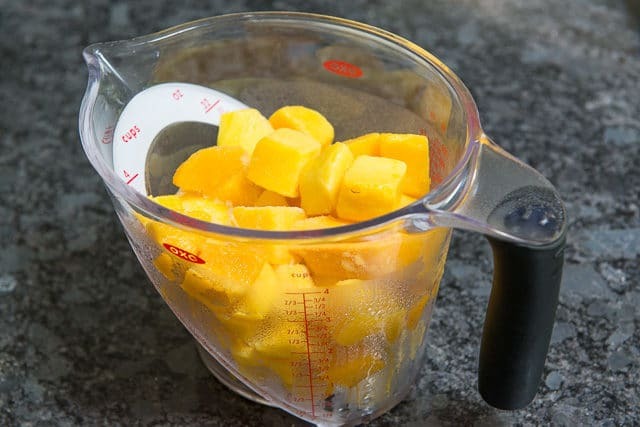 For the mango, I use frozen mango chunks and then thaw, in order to make it really easy. You can cut up fresh mango if you prefer. I know, a long ingredient list! But it’s good stuff. It should be enough to really coat the chicken breasts well. Marinade for at least 6 hours, and for 2 days at the most. ….and no, you don’t *need* to do 2 days…but someone, not to be named (it’s me), accidentally forgot about the chicken the first day. Fortunately it still tasted amazing, and the texture of the meat was still juicy and firm. 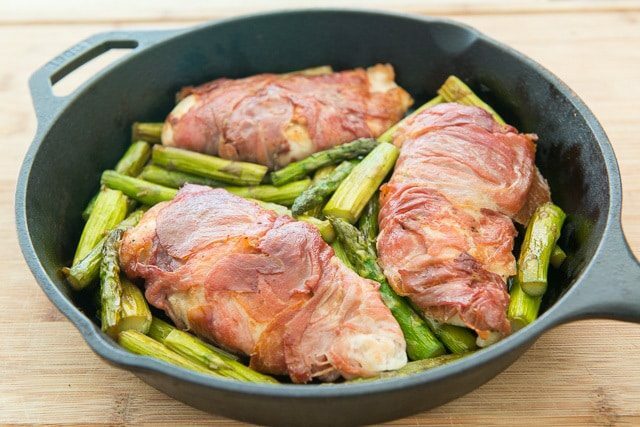 Simmer the remaining 2 cups of marinade in a saucepan for 20 minutes to thicken it slightly, and store that in the fridge until the chicken is ready. When the chicken is done marinating, it’s time to cook! This is a recipe where the chicken really needs to be grilled. The caramelization on both sides is a big part of the experience, and when I tried solely baking these, the chicken didn’t look or taste as great. If you have a grill, cook for 10 minutes total, flipping halfway through, until the chicken is cooked. 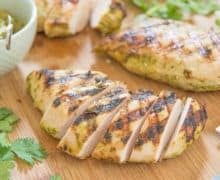 What about making grilled chicken without a grill? 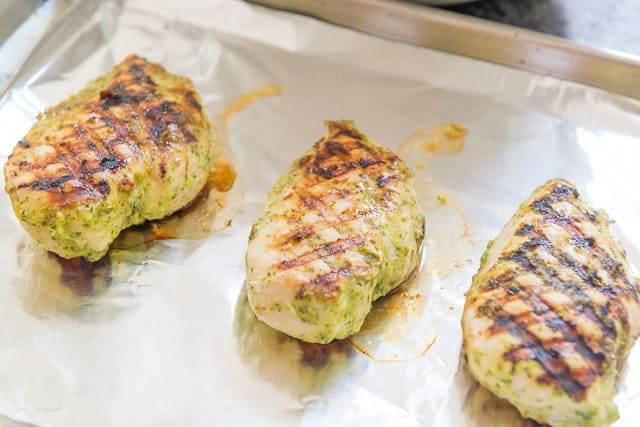 You can still use a grill pan to get the caramelization and grill marks on both sides, but it will likely not completely cook the chicken through. So place the chicken breasts on a sheet pan after searing in the grill pan, and finish baking in a 400F oven, for maybe 5-10 minutes more, until the internal temperature reads at 165F. Let the chicken rest for 5 minutes, then slice. Serve with the extra sauce, and enjoy! 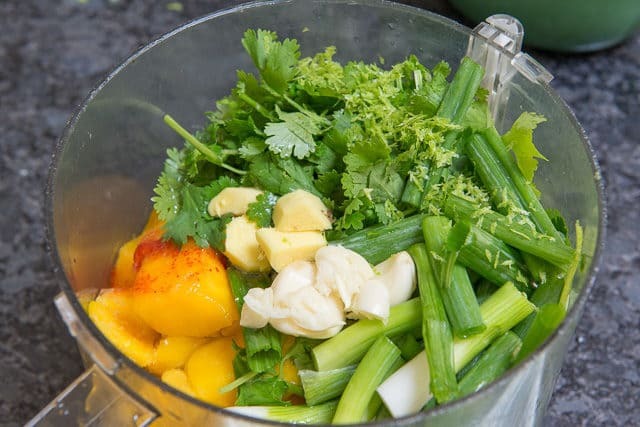 I realize that I forgot to take a photo of the simmered marinade, but you can see in the upper right corner of the photo above that it will look similar to the marinade, but with a thicker texture and a more muted green color because the cilantro is cooked. 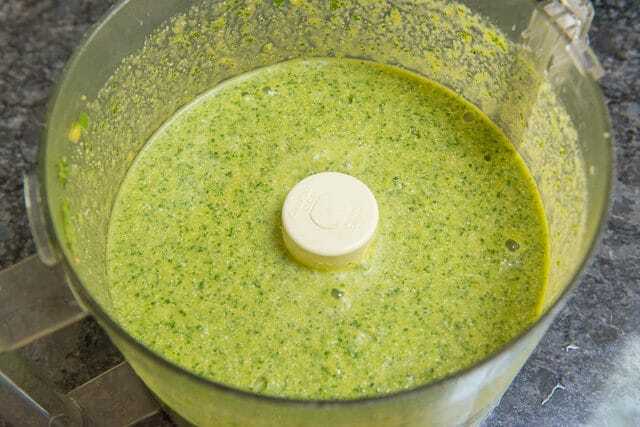 Put the mango chunks, cilantro, sriracha, vinegar, coconut milk, scallions, ginger, garlic, lime juice and zest, grapeseed oil, and salt in a food processor and puree until smooth. You should have 4 cups of marinade. 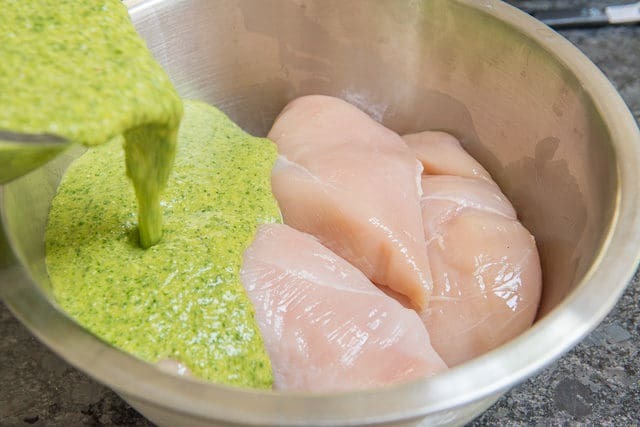 Remove 2 cups of marinade to a small saucepan, then place the remaining 2 cups in a large bowl with all of the chicken. Toss well to coat, then cover and refrigerate overnight. 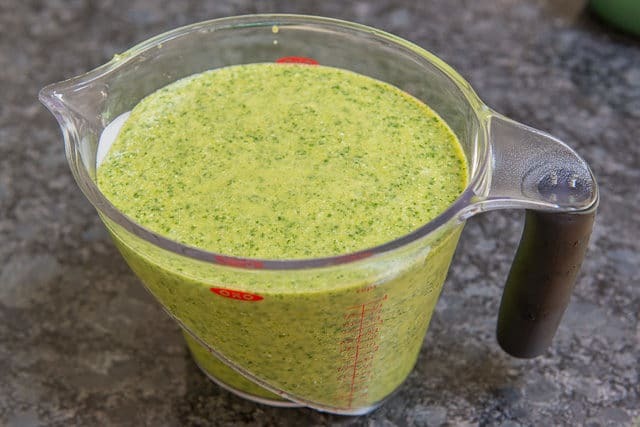 The minimum marinade time should be 6 hours, and the maximum is 2 days. Simmer the saucepan marinade for 20 minutes over low heat, stirring often, until slightly thickened. Let cool, then refrigerate. Preheat grill to medium heat. Season chicken on both sides with a small pinch of salt, then grill for about 10 minutes total, flipping halfway through, until chicken reaches an internal temperature of 165°F. Let the chicken rest for 5 minutes, then slice and serve with the sauce. Enjoy! Unless you're using every bit of the sauce and marinade, the calories are less than listed below. Adapted from Mango Cilantro Chicken. My husband just got me one since we now have a yard, but I didn’t have one for years! 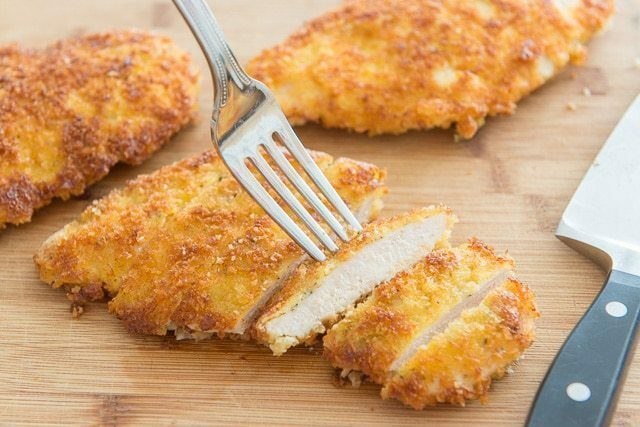 I’m always on the lookout for tasty new chicken recipes and this one looks good. I can mix this onemail in the morning before work and grill it for tomorrow’s dinner. By the way, you aren’t the only one who marinades chicken and meats for a couple of days (occasionally). I’ve forgotten, got sidetracked, went out to dinner, or have been rained out a few times. The food always comes out good. I try not to let it go full ceviche. HAHA! Yes, fortunately most marinades don’t break things down too much. One time I brined pork a little too long and it got mushy, but most of the time I’ve been good! We made this recipe and it is really tasty. We made extra so we could add it as a topping to a salad and again it was great. Hi Craig, that is wonderful! I happened to have this tonight for dinner too, in a salad that I made. It’s nice to have a little extra flavor in the salad instead of plain chicken. Glad you enjoyed it! I can’t WAIT to get a grill so I can make more recipes like this! I love mango but get this, I haven’t bought ANY this summer! What in the freaking world is wrong with me? The hubbers and I eat so much chicken, I’m always on the lookout for ways to mix it up. This recipe sounds and looks so tasty! So much flavor in this chicken. Loved it!